WFMW: Couponer Blogs – Mommin' It Up! Almost exactly one year ago, I began couponing. It was the week before Thanksgiving 2007. Can you believe it has only been a year? 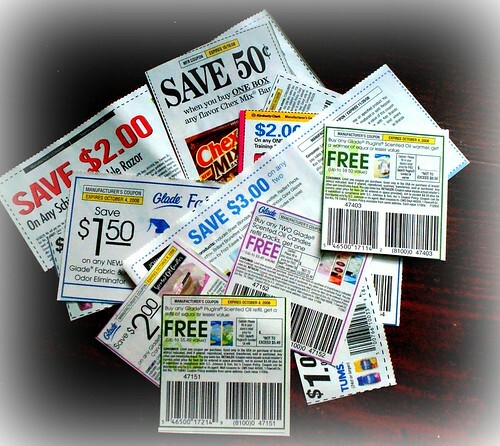 Now I can’t imagine my life without the wonderful world of coupons! Putting my grocery and CVS plans together each week takes time, but it would take me waaaay longer if I didn’t have some help from some great coupon bloggers. So, I want to give all the “regulars” I visit a big shout-out! These ladies find the deals and coupon match-ups and basically do the hard part for all of us! I appreciate them all so much! Go visit them and give them some love! and, the original blog that got me started: Money Saving Mom. Reading coupon blogs works for me when I’m planning my money-saving strategy! For more Works for Me Wednesday ideas, check out Rocks in My Dryer. Thanks for sharing these sites. I just started couponing again after years of neglect. I’m excited at the prospect of saving! Thanks for the links, I’ve been wanting to jump on the couponing bandwagon for some time! Now that I’m no longer working I think it’s the perfect time!! okay, it’s time for me to start getting serious about coupons, but they always just create a mess in the junk drawer. any tips on keeping them organized? Uh oh! I only read 2 of the 5 so now I’ve got to check out the others. I’ve also started hanging around A Full Cup’s forum because those ladies share the best information about current sales. Couponing and CVSing (yes, it’s a verb) is totally addictive. I am so honored to be one of your regulars. Thanks so much for the link love! I’m pretty sure I got started on the craziness because of your influence–though I’m no where NEAR as good as you are. I’m embarrassed to hit a CVS because I feel if I spend more than $2, I’m getting ripped off. I’m thankful that you talked me into CVSing and couponing there. I keep thinking about doing better with the grocery too, but so far I’ve failed to really stick to that plan. Thanks for passing on these sites. I am really working on my grocery budget! Oh gosh yes! I rely on blogs like those, and others. I could never coupon without them, and I don’t know how people used to do it. I have been to Money Saving Mom and was looking for some other useful sites. Thanks! What – no mention, and we even met 🙂 I love all of these sites too! You and Marcy at Stretching a Buck are my fav. couponers! So glad to have met you both. Thanks for the shout-out! I feel like I’m still new to couponing and I know that all of these sites have helped me as well! Previous PostPrevious Let’s Talk About Me, Shall We?